There's no easy road to recovery. Whether you've encountered a minor ankle sprain or need knee surgery, every athlete who becomes hurt needs to take the time to recovery and strengthen the injured area to prevent re-injury. Football players have 90 to 95 percent chance to recover to pre-injury level if they are 100 percent healed. 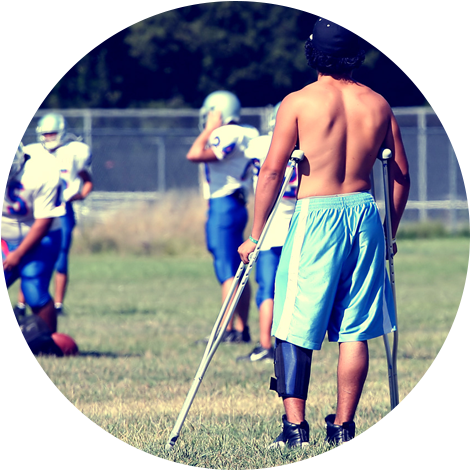 Anna Muñoz, Staff Athletic Trainer/Product Education Specialist for DJO Consumer, LLC, has seen many football players return to playing level after injury. With any injury, it's important to RICE (rest, ice, compress, elevate) to reduce inflammation. Before beginning any rehabilitation program, you need to speak with your doctor to determine the exact injury. This will help your doctor come up with a better plan to tackle your road to recovery. The following exercises are a glimpse of at-home exercises you can do to strengthen the injury and prevent re-injury. Begin on your back, legs extended, with an elastic band wrapped around both ankles. Lift the injured leg up keeping the healthy leg planted on the ground. Hold for two seconds and slowly lower down. Repeat 12 reps two times. Lie on one side with your knees bent and an elastic band loop around both legs, just above the knees. Keeping your feet pressed together and bottom knee pressed firmly into the ground, start to lift the top leg up and slowly lower down. Repeat 12 reps two times. Whether you have acute pain or dislocation, increasing the strength and range of motion in your shoulder will help you recovery quickly so you can get back to playing. Stand tall. With your affected arm starting at your side, keep your thumb pointed up. Raise your arm up your side, slightly above shoulder level. Return to beginning and repeat 10 to 12 reps two times. Use a chair, table or something sturdy to support your weight. Place your healthy arm on the table and let your injured arm hang down. Shift your body in circles to allow your injured arm to swing in circles. Your arm should be relaxed. Aim to do this for 30 to 60 seconds. Your feet and ankles carry you all day and through every workout. Once injured you can be sidelined for some time. Make sure to speed up recovery with the right exercises to strengthen it so you can bounce back in no time. Sitting in a chair, start with both feet on the ground. Lift the balls of your feet and toes up as you bend the ankle, keeping the heels planted on the ground. Do 10 to 12 reps two times. Sitting in chair, wrap a band around your injured ankle and the other end around a pole or in a door. While your injured leg is extended the band should have some resistance. Now pull you leg toward the chair, creating more tension. Release back to the beginning. Try 10 to 12 reps two times. Speed up recovery with these wrist exercises that will keep it healthy all season long. Extend your arm straight out in front of you. Use your healthy hand to bend the injured hand up so palm faces away from you. Hold for a few seconds and release. Rest your forearm on a table or your thighs. Next place one end of the band under your foot. Holding the band with your hurt hand, bend your wrist up toward your face-like you're curling something. Continue this for 12 reps, three sets. Hold an elastic band in both hands, about a fist-width apart, and arms extended straight out. Next, pull the band with the injured wrist (so your hand will curl sideways). Aim to do 10 to 12 reps two times. Stabilize the back and strengthen the core with these moves to rehab your back to full recovery. Begin on all fours (tabletop). Engage your core. Lift your right arm straightforward and hold for five to 10 seconds. Bring it down and extend your left leg out. Hold for five to 10 seconds and bring it down. Do the same with the left arm and right leg. Once you have full control of the above movement, progress to single arm and leg reach at the same time. So when you lift your right arm, extend your left leg at the same time. Hold for five to 10 seconds and return to tabletop position. Repeat with opposite arm and leg. Continue to alternate for one minute. Begin on your stomach, legs extended and arms straight overhead. Lift your arms and torso up off the ground and hold for two seconds then return to start position. Next, lift your legs and lower trunk off the ground; hold for two seconds and return. Continue to alternate for one minute. Begin on your stomach. Instead of lifting your upper and lower body at different times, you'll lift simultaneously. Engage your core and lift both your arms and legs and hold for two to three seconds. Return to start position and repeat for one minute. Want to know more about Football Injury & Prevention? Yes, send me the FREE guide.